Scripture Lady's Program: Let's Count and Spell with Jesus! 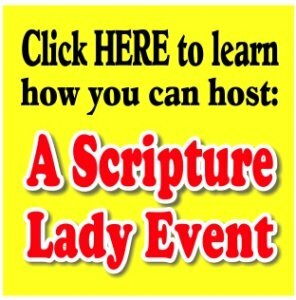 Scripture Lady’s Bible Song Program: Let’s Count and Spell with Jesus! Invite the Scripture Lady to present her preschool Bible song program “Let’s Count and Spell with Jesus!” – a fun Scripture-filled musical presentation for young hearts. Your preschoolers are learning so many things! And counting and spelling is at the top of the list. So, why not add Jesus to their learning by showing them that they can count and spell with the One who loves them the most? Let the Scripture Lady come and share fun ways to count and spell with Jesus with your preschoolers. “Let’s Count and Spell with Jesus” is full of lively Bible verse songs, Bible skits and games all designed to get your little ones growing in their ABC’s and 1,2,3’s! Bible Song #1: ABCDEFG (CEF) – Child Evangelism Fellowship is very famous for their great Sunday School songs and the Scripture Lady is blessed to have a long relationship with the chapter in Long Beach, CA. This ABC song is a perfect way to start a program about counting and spelling with Jesus. Bible Game #1: Spot the Letter – The alphabet plus a giant magnifying glass can equal a lot of fun as the Scripture Lady encourages your preschoolers to be good letter detectives. Bible Song #2: J-E-S-U-S (CEF) – Another fun CEF song all about Jesus reminds your little ones that He is their friend and that they can learn to spell His wonderful name! Bible Song #3: O-B-E-D-I-E-N-C-E (CEF) – Jesus wants all His children to obey Him because He knows it is what’s best for us. Here’s a sweet CEF song about obedience and how it’s the very best way to show Jesus we believe in Him. Bible Game #2: The ABC’s of Animals – A is for Alligator, B is for Bear and C is for Cat. Going through the alphabet with animals that God has created is a great way to learn their letters. Bible Song #4: Creation (CEF) – God used 7 days to make our wonderful world and here is a great song to help your preschoolers learn what God created on each day. Bible Game #3: Creation Bingo – Your preschoolers will enjoy playing this fun rendition of Bingo as they continue to learn about God’s amazing creation. Bible Song #5: The Baseball Song (CEF) – CEF is so wonderful at taking a well known song and adding the gospel message to it. Their Baseball Song is no exception and your kids will love singing it and acting out its fun moves. Bible Game #4: The Number Apron Game – If you know the Scripture Lady, you know she loves aprons. For this game, she will use her number apron and a Power Point presentation to teach your little ones to count important things in the Bible. For example, how many angels were on Jacob’s ladder? Bible Song #6: “The Ten Commandments” – If you’re going to count with Jesus, you better include a song about the 10 commandments. This is a fun favorite of preschoolers and is a lively way to teach God’s great laws. Bible Song #7: The Gospel Fuzzies – Finally, Kathy has been entertaining children for years with her rendition of “The Gospel Fuzzies.” These are 5 colorful finger puppets that all point to Jesus! They’re found in the Bible. It’s true. It’s True! Gave gave them to me and to you!